Having a Quality Blog and not having visitors that means its just like having a Computer without Internet. Though If you are writing quality content then you must get proper visitors or traffic. For that you need to do SEO [Search Engine Optimization] which includes On Page SEO, Off Page SEO and Link Building or Backlink Building. Google’s Matt Cutts is to be believed Link building is important for Getting page rank which eventually results into high traffic from search engine and to get high SERP that's why you need to have high PR dofollow link pointing to your blog. So here are some links which might find useful for building efficient backlinks for your blog which will increase your blog page rank. 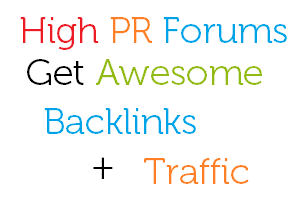 Trust me if you successfully made backlinks for your blog more than 500-1000 then your Blog or Website Page Rank will increase in just Few Weeks ! Now this is the list of High PR Forums where you can make your profile and put your blog / website link by editing your profile this is the most secure and ethical way. Just copy paste the following links and register there. Enjoy ! @ Rohit : The list compiled by you is just superb but it will really require a dedicated effort to get started with all of them. Can you just post a few to get started or can you just oprioritise the list so that one goes first with priority 1 then priority 2 etc... We have subscribed to your content through email. Hello sir I have a question regarding this post that how to submit form I had registered my self? can you elaborate what you want to say with the site where you have registered?? Great List indeed . It really requires dedication to register in all of them .